Great to see this written up so nicely! Unfortunately it crashes Firefox on my MacBook Pro (and forces Safari to reboot). I've reported to a friend at Apple. This happens occasionally with a shader on glsl sandbox though most work. Graphics card info copied below for info, in case you've any idea. Seems like on OS X there are some problems with complex GLSL shaders. Maybe there's some bug in the OpenGL drivers. I don't have a Mac so I can't reproduce it, I hope they will fix it. Awesome thinking here. I'm wondering -- as soon as you have other raymarched geometry in the scene, say some balls in the water or some birdy thingies just atop of it, this optimization could no longer be used, right? You could do regular raymarching, marching by the minimum between these two functions. 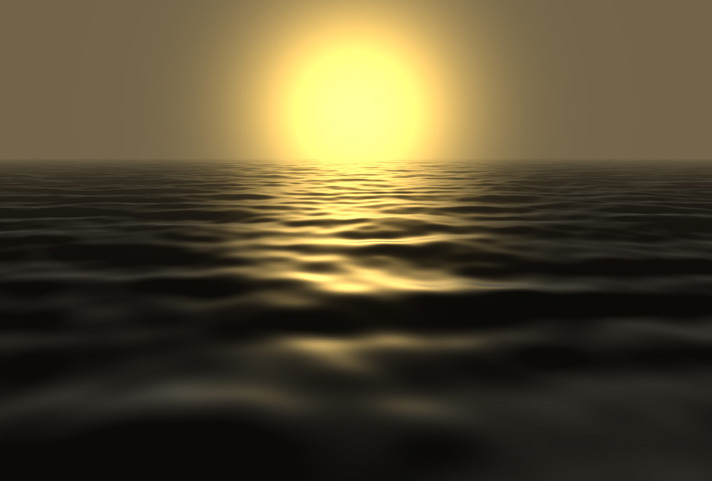 In order to have reflections on the water one optimization should be removed: currently all rays pointing up are discarded, this would prevent having these reflections and should be removed at least for secondary rays. I tried to implement this but weren't getting anywhere and admittedly didn't fully grok it in all its glory. 1. intersect the ray *once* with both the flat plane that's just on top of the highest possible elevation, and the flat plane that's just below the lowest possible elevation. Two flat planes intersected just once as per classical ray-plane intersection test returning distance to intersection point. 2. If both distances are < 0, don't proceed at all of course. The ray never even potentially intersects the "terrain". 3. Otherwise, classical raymarch but not until the usual fMaxDist (whether this may be 30 or 300 or as in my case 3000000) but only the distance returned by the intersection test (more like the max of both distances returned). Then stop marching. This is equivalent to "finding the interval within normal marching happens", no? Just before step 3 -- *if* rayPos.y is above upper plane or below lower plane, position at intersection point and march from there, and set maxDist to distance from intersection of the *other* plane. So you are basically implementing something similar to my “step 1”. In “step 2” I was not doing regular raymarching with a distance field. What I was doing is raymarching using the maximum between the distance field and a fixed value. 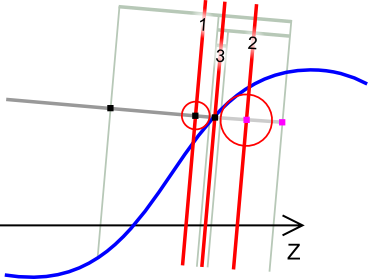 This fixed value should be the highest possible value that does not miss the first intersection between the ray and the surface. The consequence is that “step 2” is faster but only gives you a coarse interval for the intersection point. This is why “step 3” is needed: “step 3” is used to refine the rough result of “step 2”. This way you have to do only one check in most cases. In my shader I was doing only test 1 because I knew that all the rays were started from above the surface. In general the main trick is that you don’t really have to always raymarch by a distance field. For example if you have a very complex distance-field function and you find a way to remove some heavy computations from this function ending up with a new function that gives you a higher estimate of the distance instead of the real distance, you could use this modified function for your raymarching. You would end up having more iterations, but if each iteration is a lot faster, then the overall loop could be faster. Знакомства Caldad da Rainha. Сайт знакомств Caldad da Rainha бесплатно, без регистрации, для серьезных отношений.